One of my mantras is K.I.S.S (Keep it Simple Sisters)! Many times, in life we over complicate things. In the words of Lauren Hill “It could all be so simple, but you’d rather make it hard!” If you are struggling to achieve your goals or you keep making detours on this road called life. I have outlined the five Cs you need that will get you right back on track. Remember goals don’t work unless you do! For those of you that have created a vision board and stuck it in a corner somewhere I want you to pull it out and look it, so you can remember what your goals are. Write the vision make it plain. The year is not over yet, there is still time to get your blessings. All our goals are different, but I think these 5 tips will help you reach them! You need to be confident in your abilities, in your gifts and that they will make room for you. Don’t get confident and conceited confused. Because people often do. If you are well versed and an expert in your field, you must exude confidence. No one will put someone on a major stage if they’re unsure of themselves. Study your craft and watch the doors fly open or create your own opportunities! Knowledge will give you power, but Character will give you respect. In the end, all you have is your good name. I’ve often heard character is what you do when no one is watching. Always take the road less traveled, you will find your success there. You will learn some things along the way that give you knowledge and fortitude to reach your goals. One of my favorite poems is myself by Edgar Allen Guest to quote a verse “I have to live with myself and so I want to fit for myself to know. I want to be able as days go by always to look myself straight in the eye. I don’t want to stand with the setting sun and hate myself for the things I’ve done! I can never hide myself from me, I see what others may never see, I know what others may never know. I never can fool myself and so. Whatever happens, I want to be self-respecting and conscious free! Always do what’s right and right will surely follow you. It’s not what you know it’s who you know. To increase your net worth, you must network! I don’t care how smart or talented you are you cannot make it in this world alone. Surround yourself with good people who are going somewhere. Connect with organizations Like the BOSS network. My territory has been enlarged with the connections I have made through them! Be sure to evaluate who’s on your front row, it will tell you a lot about your future. If you’re around 4 people that don’t want anything out of life, you’re bound to become the 5th. But if you surround yourself with 4 go-getters that never give up and encourage each other you will all win! Reaching your goals will not be easy. That’s where commitment comes into play. You must stay the course when things aren’t going so well. Everyone can proclaim to be successful when you’re on the top of the mountain but what about the valley experiences. Can you still stand tall when you face adversity? When the mortgage crisis came in 2007 people were changing careers, but I knew this is what God had called me to do. I remained committed to my purpose and my passion even in the troubled times. Once you’ve mastered the 5 C’s to success there no limit to what you can achieve! It is my hope that we all see our visions become a reality. Because when one of us wins…we all win! Here’s to you! Tammy Moore is Division President at Diamond Residential Mortgage and owner of Tammy P. Moore & Associates. 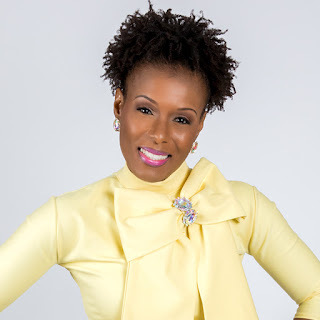 She is a motivational speaker and Credit and Financial Coach. In her spare time, she is the Budget Conscious Fashionista, where she teaches Style $ense: How to style your outfits on a budget without breaking the bank!